“To Ukrainians and my friends everywhere in the world. Tomorrow, there is going to be another trial for me. I want to make a statement before the court and, once again, declare that I am innocent of any of the crimes I am being accused of in Russia! I have committed no crimes or offences under the Articles 105, 322, 33, or 365 of the Criminal Code of the Russian Federation. My soul ate no garlic, and will not stink! [a Ukrainian proverb] Therefore, I will not agree to plead guilty to any crime! I am not guilty, and I refuse to lie and slander myself in exchange for shorter jail time. I have no intention of bargaining with the prosecution that kidnapped me from Ukraine and is now slandering me! I do not trade away my honor, conscience, and truth! This is why I am instructing my lawyers to conduct my case in an honest, lawful, and transparent way, and to bring it to the public attention, so that the whole world could see how dishonorable justice is in Russia! My lawyers chose a correct line of defense for me, and I am in full agreement with it. I am also not going to bargain – with anyone! – about my beliefs and my methods of fighting back. I will continue my hunger strike until I am allowed to return to Ukraine or, as a minimum, until my detention is replaced by house arrest in the Ukrainian Consulate in the Russian Federation, which is, essentially, a part of the Ukrainian territory in Russia. 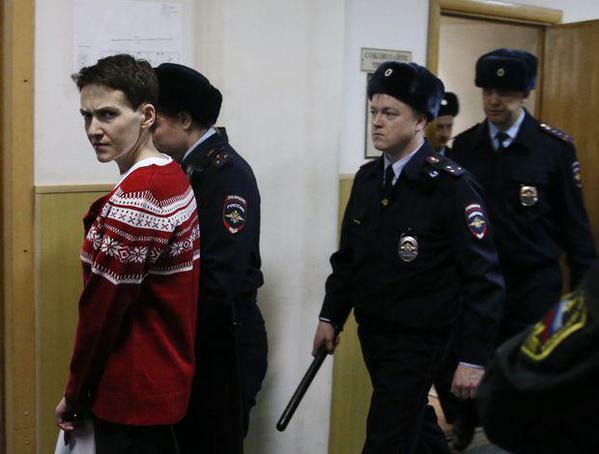 Nadiya Savchenko has been on a hunger strike since December 2014. After 83 days of hunger strike, including refusing glucose injections during the last two weeks of them, Nadiya agreed to eat chicken broth. However, ten days later on March 16, Feygin posted a letter from Savchenko saying she had resumed her hunger strike to protest her continued unlawful detention by the Russian investigation authorities. She is 9 days back on hunger strike today (or on Day 92 of it as social media posters proclaim). This entry was posted in #Free Savchenko, English, English News, Letters, Pictures, War in Donbas and tagged #FreeSavchenko, #freesentsov, #Nadiya Savchenko, #RussiaInvadedUkraine, #StopRussianAggression, #UkraineUnderAttack, Human Rights, Ukraine. Bookmark the permalink.